People from all walks of life come together to prepare mouth watering meals and have inspiring conversations. Sacred Kitchen combines the warmth and joy of a family supper with the ancient ritual of breaking bread together. Each course is infused with a spicy blend of humor, vulnerability, and powerful facilitation creating a space where all feel welcomed, deeply appreciated, and invited to show up authentically. Food is sacred and magic happens when we cook together. We can’t wait to bring that magic to you. If you’re creating a team building event, a memorable celebration, or a retreat let’s talk! Creative Team Building Events. Your team at work will leave with a deeper sense of connection to themselves and to each other. You'll be amazed at how our connections in the kitchen translates to more effectiveness at work. Extraordinary Celebrations. Sacred Kitchen creates experiences that usher guests into the next chapter of their lives with a deep sense of connection to those who matter most. Sacred Kitchen is great for birthday parties, going away celebrations, retirements, weddings and uncoupling celebrations. Fundraisers and Investor Dinners. Sacred Kitchen creates an extraordinarily positive and energized atmosphere for you to share your mission and ask for for contributions to your cause. Retreats. Sacred Kitchen has the know-how and chefs to produce food onsite for hundreds of attendees. We’ve worked nationwide creating delicious multi-day celebrations of the human spirit. Leadership Retreats. 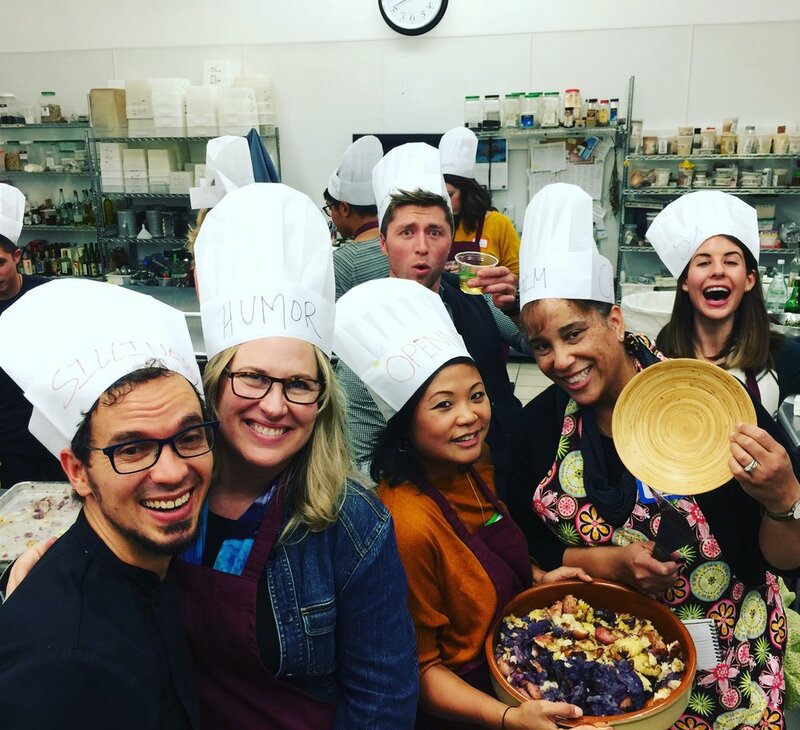 Chef Jesse works with executive and leadership teams to help them collaborate more effectively and amplify their vision for the organization, using Sacred Kitchen experiences as a powerful and inspiring context. Relationships are the Most Valuable Currency –Great relationships are the foundation of great businesses and the signature dish of a life well lived. Food is a Powerful Catalyst for Connection – Humans have been breaking bread together forever and we are neurologically designed to relax and connect over a meal. It's a Unique, Fun, and Inspiring Event – We don’t know anything else quite like it. Master Facilitator | Master Chef – Chef Jesse's 20 years of culinary creativity combine with a deft facilitation touch to create an experience that your team will be talking about for days. Creatively Customized – You’ll meet with Jesse to customize your event. Together you will create an delicious and unforgettable experience that will resonate with your people. Jesse is a leadership facilitator and chef with almost 20 years of experience leading teams in the joyful art of making beautiful deliciousness. Jesse is a seasoned facilitator, leadership coach, and start up entrepreneur who is passionate about supporting people’s personal growth. At the intersection of these worlds of food and interpersonal development lives Sacred Kitchen, a place where preparing and sharing food are the key ingredients for creating powerful connections and beautiful relationships. Jesse cares deeply about social justice and he is passionate about creating a felt sense of welcome for all people. Jesse lives in Oakland, loves to dance, and is the father of a 4th grader, Elijah.